Specially designed in cooperation with Alcoa Fujikura Ltd. for guiding fiber optic or CATV cable safely and efficiently, Condux Cable Sheaves feature an innovative hanger arm that eliminates the possibility of cable coming off the sheave or binding against the support arm. With the removal of a pin, the hanger arm separates and allows cable to be slipped in easily, even at midpoints. 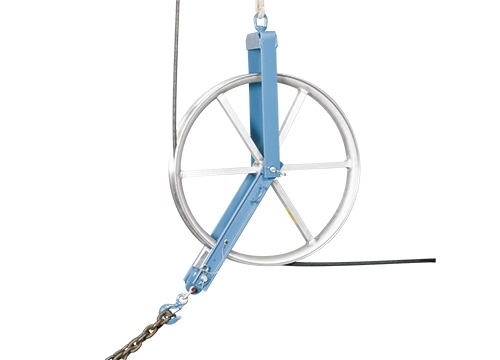 12-inch (305 mm) or 24-inch (610 mm) sheave diameters allow for a gentle cable arc. Aluminum sheave construction means durability with less weight. Maximum capacity is 1,500 lbs. (6,672 N). Replacement Sheaves available. See Specifications and Selection Charts on page 113.